We know leather riding chaps aren't appropriate for all activities. That's why Harley offers women's activewear pants, for all those non-riding moments. 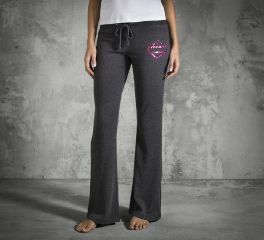 Comfort and style meet up in our Pink Label Activewear Pant featuring an updated shade of pink and a dash of bling. Pair these bottoms with a tank, cami, or long sleeve tee for relaxed style. We're so proud of our strong-spirited lady enthusiasts whenever we see them in Pink Label gear.